Preheat oven to 375 degrees, lightly spray a deep dish pie plate or 9x9 baking dish with cooking spray. 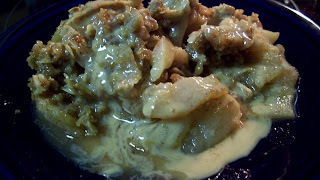 Toss sliced apples, lemon zest, lemon juice, 1 tsp cinnamon, nutmeg, ginger, and granulated sugar in a bowl. Pour apple mixture into baking dish. In a clean bowl, mix oats, flour, brown sugar, and cinnamon. Cut in butter with your fingers or pastry blender until mixture has the texture of coarse crumbs. 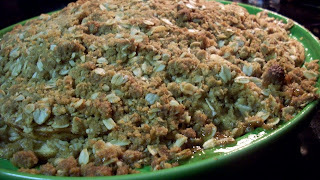 Pour crumb mixture evenly over apples, patting lightly in place. Heat sugar in a heavy-bottomed 2 qt sauce pan over med-high heat. Stir constantly as sugar begins to melt. Once sugar begins to boil, stop stirring until all sugar is melted. Add butter and stir until melted. Remove from heat, wait a few seconds, and then slowly whisk in cream. Let stand to thicken.